In my humble opinion, the Toddy is one of the best cocktails ever created. It’s simple, easy to make, and warms your soul in more than one way. As you know, I love finding new ways to introduce different flavors into classic cocktails, simple twists that end up creating a whole new drink. I’ve been thinking about this one for a bit – a warm Hibiscus cocktail that also has a bit of kick. When I was working on this cocktail, I was thinking about the flavor of agave that comes through so beautifully in Patron silver – bright, fresh and crisp. Lemongrass and Hibiscus were the two flavors that initially came to mind – and I fully admit that I was probably influenced by the beautiful 2018 Patron 1-Liter bottle design! The flavors of agave mix well with the sweet flavor of the tea, and the addition of green chili liqueur adds spice with an additional layer of vegetal flavors that compliment the tequila itself. These are guaranteed to be on repeat all winter long in my house, and hopefully yours as well. Cheers! Build in a mug, and garnish with a lime slice, a stalk of lemongrass, and a tea leaf. Chop the lemongrass into ½ inch pieces. Add to a teapot with the hibiscus tea and add hot water. Steep for three to four minutes, or until the tea is of the desired strength. Keep warm until ready to serve. This is a sponsored post written by me on behalf of Patrón Tequila. All opinions are 100% mine. It’s Citrus Season!! My most favorite produce season of the year! I’ve been loading up on all the exotic citrus coming into the market, especially fresh yuzu the Japanese citrus that tastes like a mix between lemons, Meyer lemons, and clementine oranges. They are bright, and floral, and pair beautifully with unaged tequila. The classic sour recipe is one of my favorites, and unsurprisingly, works well with yuzu and Patrón Silver tequila. This cocktail is brighter and more vegetal than a traditional whisky sour, and the yuzu adds a level of complexity that other types of citrus simply cannot. When you’re picking up your Patrón, keep your eyes out for their seasonal limited edition 1 Liter bottle: it’s a festive bottle that is not only bigger, but makes for a great hostess gift. I’ve made a neck tag you can download, print out, and give with a bottle of Silver – Limited Edition 2018 1-Liter. Happy Holidays! Dry shake all the ingredients until thoroughly mixed. Add ice and shake again. Strain into a lowball glass with a large rock. Garnish with a twist of citrus and two maraschino cherries. Prosecco has quickly become one of my favorite bottles to always stock in my fridge. It’s great to sip on its own, it’s an essential ingredient in a spritz, and it’s absolutely divine in a MioMosa (see what I did there, wink wink). When one thinks of a mimosa, the first thing that comes to mind is brunch, an association that is difficult to argue with. The other association is orange juice, but a great prosecco like Mionetto works well with different kinds of juices. I usually go to the store and stock up on a range of juices: pear, apricot, and mango to name a few. I like to set out a big bowl with ice to chill the bottles and juice in carafes so that guests can try different combinations as they wish. PRO TIP: Set up a separate table to get the guests moving and out of the most valuable space in your home: your kitchen. I recently discovered that Mionetto makes the most adorable individual serve bottles of prosecco – which a great for picnics, cocktails on the go, or for sipping at parties. 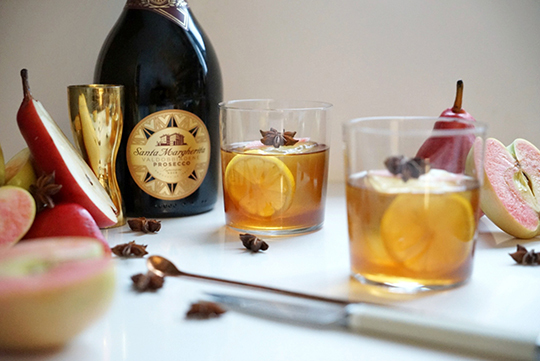 Just pop one open, add a straw, and maybe a splash of juice and you’ve got a great party-ready cocktail. On that note, let’s pop some bottles and get this mimosa party started! This is a sponsored post written by me on behalf of Mionetto Prosecco. All opinions are 100% mine. I’ve been really inspired by all the fresh apples that are in season right now, and even at the small market in our town, we’ve been getting a great selection. Honeycrisp (my favorite for snacking), Fuji, and those gorgeous Pink Pearl apples that have a green skin and bright pink flesh. Oh my, I’ve been in heaven. 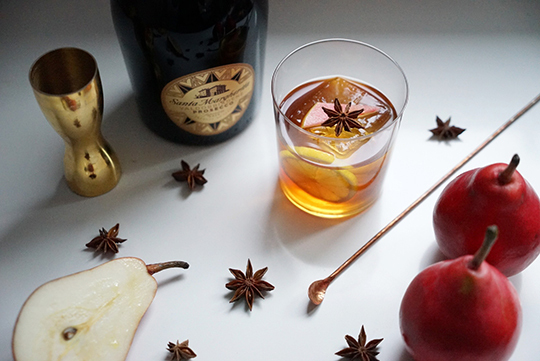 I wanted to create a sparkly apple spritz in celebration of apple season, based on the King’s Landing recipe in the new Death & Co Cocktail Codex book (which you should buy if you haven’t already). 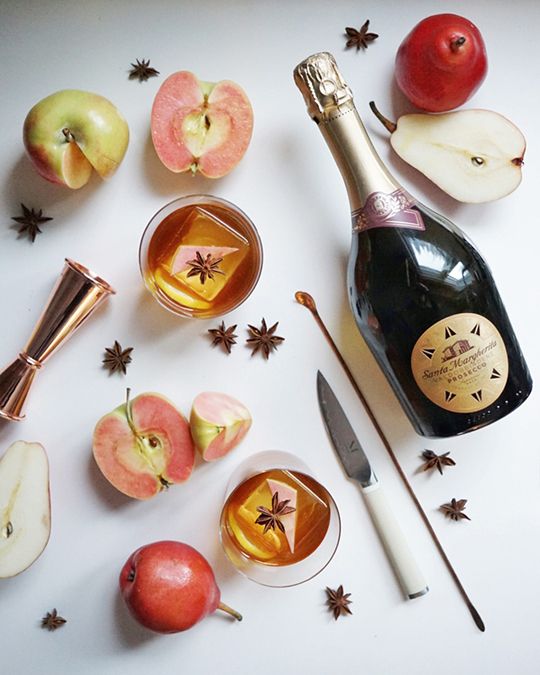 I’ve topped this apple-y beauty with the elevated Prosecco, Santa Margherita Prosecco Superiore made from Glera grapes grown in Valdobbiadene, Italy;a region that now has its own DOCG classification. 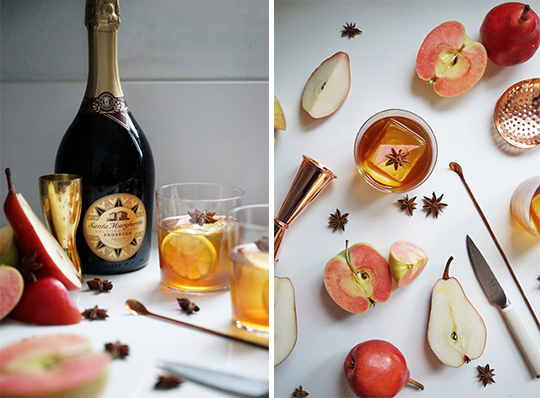 This specific Prosecco adds another layer of flavor to this cocktail, a bright, crisp, fruity flavor of apple and pear. I wanted to add a bit more spice, so there’s a dash of star anise; as well as a bitter kick, to help balance out the sweetness. This beautiful number is sure to be on repeat throughout the holidays! This is a sponsored post written by me on behalf of Santa Margherita Prosecco. All opinions are 100% mine. Yes, I know fall is upon us - but trust me - you're going to want to bookmark this recipe for next summer. It's ah.mazing. I recently saw that you can use your ice cream maker to make cocktails, which was quite frankly an epiphany in my mind. Why you ask? Because frozé is absolutely one of my favorite things about summer, and I hate making it in a blender (it's always a mess). AND, this is a two ingredient recipe, which means it is easy! Victory! I'm using Rosé Aurore Côté Mas, a beautifully crisp, mineral forward rosé from Provence, which is delicious on its own, but also makes a mean Frozé. I highly recommend this gorgeous rosé, and it comes in a one liter format, which means there are two extra glasses in each bottle! Add the entire bottle of rosé and the grapefruit soda to your ice cream maker. Turn on and let run for approximately 60 minutes until frozen. 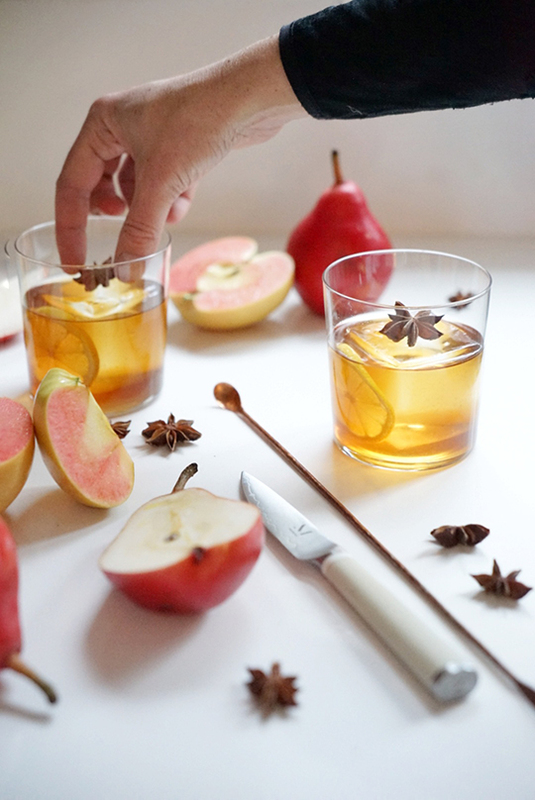 Serve and garnish with fresh fruit. Pro Tip: Freeze the cylinder overnight to ensure that it is sufficiently chilled for Frozé preparations. This is a sponsored post written by me on behalf of The French Ministry of Agriculture. All opinions are 100% mine. This summer I have been working with the French Ministry of Agriculture to feature some of the products the organization represents, specifically cheese and wine (I know, my job is tough...). Fortunately for me, all of the products they have sent for me to try out have been delicious - all the wines have been inspiring to say the least. I wanted to try out making a few cocktails with these gorgeous French wines, and one of my favorites so far is the Ginger Pinot Blanc Spritz, made with Trimbach Pinot Blanc. 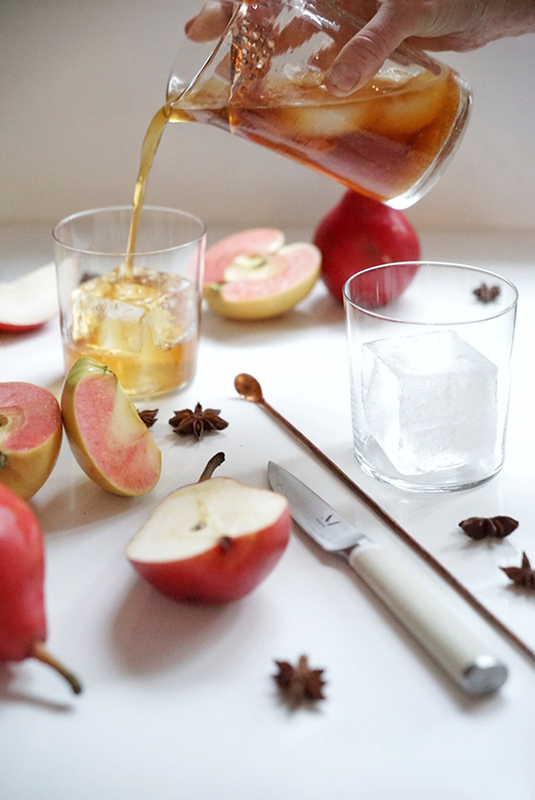 I found a lot of crisp pear and apple notes on this flavorful wine, so I wanted to pair it with ginger and mint to give it a bit of spice and herbal sweetness. I'm really into this spritz, it's a great cocktail for sitting outside on a fall day - bright and refreshing with a hint of fall flavors. Trying out a new format: Video! Leave me a comment if you like this new recipe format! Garnish with a lime wheel and a sprig of fresh mint. French Wine and Cheese - Is There Anything Better? I have a serious question for you: is there anything better than wine and cheese? Yeah, I didn't think so. One of favorite things about visiting France is enjoying the fresh bread and local cheeses that are usually served with seasonal fruit and a delicious glass of wine. France does a few things exceptionally well, and I have to say, cheese and wine are two of them. Fortunately, we don't have to travel to France to enjoy some of their best products, these agricultural products are shipped all over the world! For this post I have partnered with the French Ministry of Agriculture to pair some of my favorite French cheeses with a selection of wines they have introduced me to. I never cease to be surprised with the quality of French wine, and unsurprisingly, these wines are no different - complex, drinkable, and all wines that pair beautifully with cheese. For this post I wanted to create a few decadent scenes that embody the French joie de vivre with references to French art and architecture throughout the ages. I hope you enjoy. In my opinion, one of the most decadent and delicious cheeses out there are triple crème cheeses, which are a more intense version of a brie. Saint-André is a perfect triple crème cow's milk cheese that pairs beautifully with the Champagne Guilleminot, which has flavors of toasted brioche, spices, and candied nuts. Serve with seasonal fresh fruit, such as plums, pulots, and currants and fresh baguettes. Another one of my favorite things about France is the butter. Oh, my the butter! I always overdo it with the bread and butter when I'm there, because it's so delicious! I'm a salt addict so I like to sprinkle salt on my buttered bread, which pairs beautifully with a glass of red wine from Bordeaux. Château Bonnet might become my new house wine because it is so drinkable - it is light and refreshing while at the same time, full of complex flavors of vanilla, ripe fruit, and a slight smokiness. Food helps bring out the flavors in this wine (like most European wines), the creamier the better. The Château Bonnet Red is made from a blend of 50% Merlot and 50% Cabernet Sauvignon and is harvested from 17 year old vineyards with clay-limestone and clay-siliceous soil that gives this wine a nice acidity and minerality. It is unsurprising to learn that St. Agur is the number 1 blue cheese in France, as it is hands down one of the most delicious and memorable cheeses. I often refer to St. Agur as a gateway cheese: its creaminess helps people learn to love the spiciness of blue cheese, a first love for many. As they say, the first cut is the deepest. St. Agur pairs well with many different styles of wine, but lately I have been loving it with the Château Bonnet White, a crisp and refreshing wine that is perfect for summer. The wine is made from 55% Sauvignon Blanc, 30% Sémillon, and 15% Muscadelle, and has flavors of peach, meyer lemon, with a gorgeous floral note. Of course, the true pleasure of cheese is putting out a gorgeous spread of a variety of cheeses, different types of breads and fruit and tasting each one with a different wine. The possibilities are endless, and they are all delicious.